For job seekers in need of a resume with a contemporary flair this modern design template should fit the bill. The geometric shapes that envelope the sections have a novel appeal, the borders around them finish them off. The spacing between each element helps occupy more white space on the page than would normally be used up. If you need a template that helps to augment the material you have to write, this design may help you in that area. A modern method of applying for a job is to use the form provided by the employer. Passing are the days of paper resumes and cover letters if they haven't already passed. Although it is probably a good idea to still have paper copies of these documents with you at the interview, e-resumes are becoming the norm. They are generally attached to the job application when you submit it. At Resume4Free we are versed in the creation e-resumes and various other e-documents. You can create your modern electronic documents here yourself via our online creators. If you are new to the modern way of creating resumes and applying for jobs it's all right because we have a library with career building articles, tutorials and how-to's. 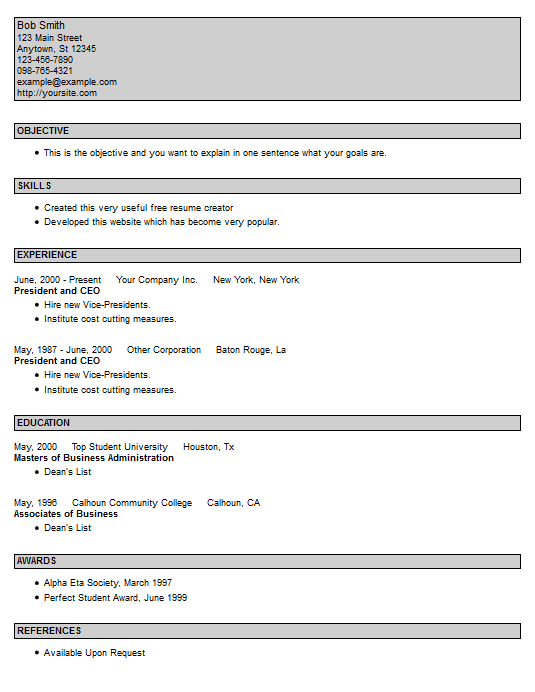 You can get this template from our resume creator you will not need to pay for it or join us to get it. The help and tips that are built into each step creates a productive environment to simplify the generation of these documents.